The other day the kids and I witnessed a guy completely spin out into a ditch while we were waiting at a stop light. A couple of us drivers who saw had stopped to help and make sure he was okay. We stood there thinking the guy had blown a tire…or, at the very least, he had been playing on his phone and lost control of the car (and who knows, maybe he did). There had to have been a good reason he jacked up someone’s mailbox and landed himself in a ditch. I secretly laughed a little (not out loud because I’m sure he was shaken up). But the truth is that we all have that kind of reactions to creepy crawlies, don’t we?? And while a spider isn’t a bug, per se, spiders and bugs alike illicit that same reaction, especially when you’re not expecting them! Finding them in your house is just has nerve-wrecking, too! That’s what happened to me recently. A few months ago I decided to tackle my crafting closet. 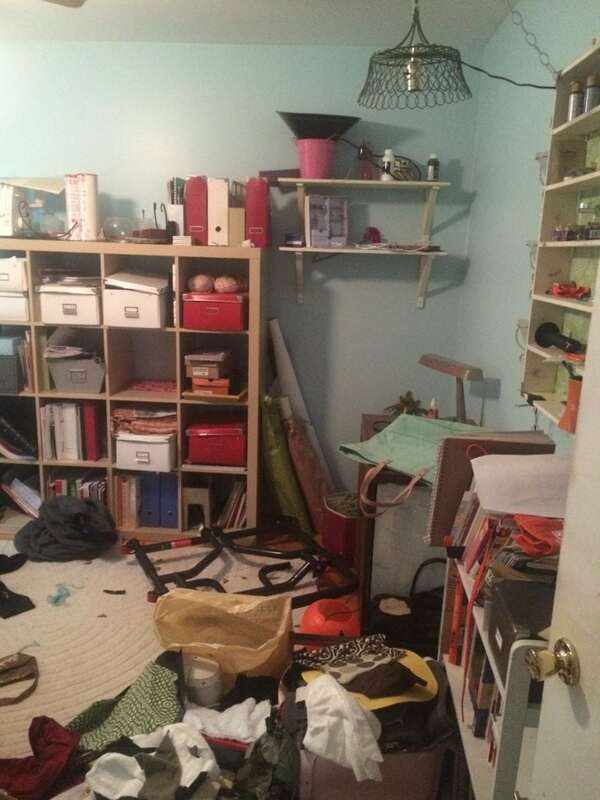 It’s not actually my crafting closet. More of like a place where I threw crafting supplies that I didn’t know where else to put when we moved in 5 years ago and the stuff has largely been untouched since moving in (with the exception of adding to it since moving in!). I have everything from Chinese silk brocades, decorator fabrics, and some woolen materials from when I used to sew pants and outfits, including skeins of wool from my knitting days. 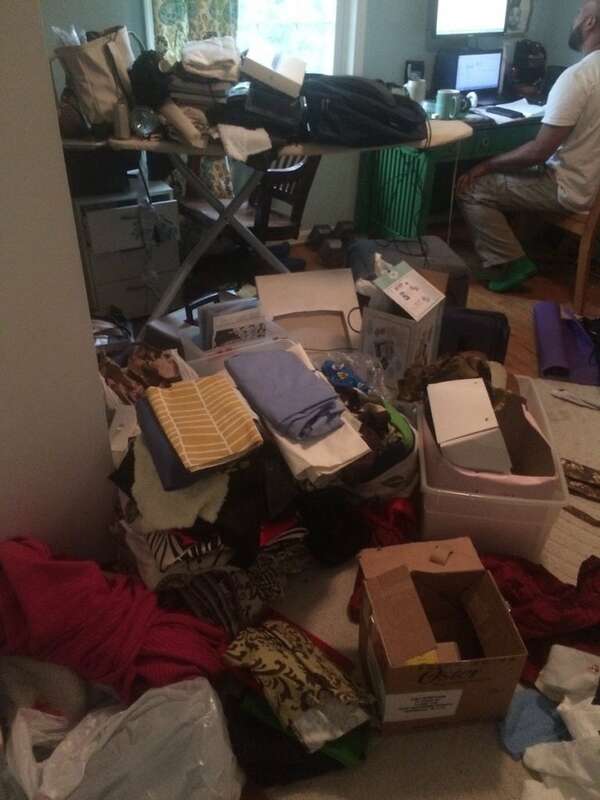 Below is what it looked like on closet clean-out day a few months ago. (Excuse the crappy cell phone pics). Anyhow, imagine my surprise when I started cleaning this stuff out and found a few of these little bugs. 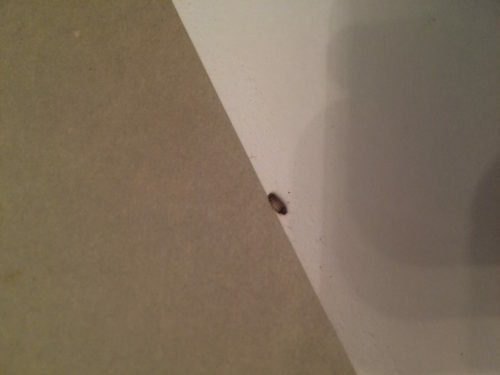 That, my dear friend, is a carpet beetle larvae. I’m getting the creepies just looking at it. In fact, I’ll make this picture smaller so it’s not all in your face. Feel free to scroll quickly, because you know I am!! LOL. I didn’t know at the time that’s what it was, but thanks to Google (God, what would we do without Google?? ), I figured it out. I learned that they looooove dark, undisturbed places where they can munch and chew on natural, organic fibers, like my wool yarns, wools fabrics (didn’t have many of those), and silks. I also learned that carpet beetles like to lay eggs on or under wool rugs. They also like to feed on animal hair (we have no pets). Museums are afraid of getting them because they can destroy biological specimens, according to Wikipedia. Outside in nature, carpet beetles love pollen, but when they come in on cut flowers or fly in through open doors or windows, or find small cracks, then take years to turn from larvae into adult beetles. They’re harmless to humans, don’t bite, but their hairs can cause allergic reactions. Anyhow, I immediately called American Pest, with whom we have a bi-monthly service year-round (they help so much with the ants that we get). They treated the office, and I haven’t seen any other larvae. But unfortunately, I never cleaned out all the fabrics. I tossed them in plastic storage bins, thinking that would do the trick. But in the last week, I’ve been several adult carpet beetles throughout the house, even in rooms where there are no silks or wools. Adult beetles fly, so they probably just flew there. But I also read that they like usually like to invade birds nests, and if you’ve got nests in an unused chimney, that would be the problem, too, along with dusty air ducts. Sometimes breeding grounds can be a dead rodent in your attic or dead insects in your walls or attic, which could be drawing them inside the house. I’ve become quite an expert in the last week. Can you tell? I debated on posting about this because it just sounds gross, doesn’t it? But it got me thinking about the fabrics and materials that we hoard….and the other clutter in our lives that create little hiding spots for pests…or the forgotten maintenance to our homes that could let in pests (like unused, dirty chimneys or dirty air ducts). So I thought I would share with you some steps that might fight your own nasty little pests and to minimize the mental stress of dealing with invaders! My husband thinks I’m silly for wanting a bug-free home (“You can’t ever totally get rid of bugs!” he says). But as natural and normal as bugs are, I’d like them to be outside. Allow yourself a little freak-out time, no matter how silly someone tries to make you feel for being bothered by the pests. Talk to your friends and family about it. Let them know it’s bothering you. You’ll feel better simply by talking about it. Like I said, Google is your friend! All it takes is 5 minute to identify whatever bug you’ve found in your house. All you have to do is type in what you see and found, and Google will do the rest: “Found a bug in my closet small and furry.” You’d be amazed how quickly Google finds the answer with just typing in description words like that! Most times, you’ll know what it is, like ants, centipedes, or worse. Take some time to become an expert and learn about their breeding habits and things you can do immediately to make the situation better. Check thoroughly through your house and see if you notice heavier pest activity in one room of the house versus the other parts. If there is more activity in one area than the other, that’s likely the source. STEP 4: Declutter, Declutter, Declutter! Well, it’s obvious: the less clutter you have, the less hiding places for pests to get into. I wouldn’t call myself a pack rat, but I have things that I’ve owned for years because I always think “Oh, I’ll use that someday!” Same with all my fabrics and yarns. But now, I’m planning to get rid of all of that stuff (or wash and properly store the stuff I want to keep). If I haven’t used it in years, I probably never will. Below is a picture of Phase 1 of Room Clean-Out months ago, with piles of things I was getting rid of. I can’t wait to take an “AFTER” picture and show you how it looks once I remove everything unnecessary from the room! The absolute best thing you can do for your home and your psyche when you find bugs in your house is to go on a cleaning binge. Not only are you decluttering and getting rid of things, but you’re also doing a deep clean you probably haven’t done in a long time. Use hot, soapy water, and maybe some vinegar, too. Be sure to wash as much of your fabrics as you can, in hot water and dry on high heat. I plan to wash all the blankets that were in the hall closet below, as well as whatever fabrics I want to save from my fabric stash. With carpet beetles, the advice I read was to vacuum often, especially under heavy furniture where it can be dusty, and to vacuum under rugs, especially if they’re wool rugs. This is true for other pests, as well. With ants, any bit of crumbs, they’ll find! I also tackled this hall closet that I hadn’t touched in ages, and actually found a pair of silk curtains that I stored away during my cozy family room makeover 6 months ago. These silk curtains, when left in a closet like this, could become food for carpet beetles. Eek! Years ago when we were invaded by ants the first spring in this house, I had found a product that I heard awesome things about. It’s called diatomaceous earth. It’s totally natural and works when bugs walk through it. To humans and pets, it’s safe and looks like fine powder. To bugs, it scratches their bodies and makes them lose water and become dehydrated and die. It’s made of ground up sea fossils. Pretty awesome stuff. Years ago I had ordered a huge 50-lb bag of it from Amazon, and it’s been in the garage, so I’m hoping that it will still be effective. If you’re using diatomaceous earth, be very careful not to breathe in the dust when applying it. The little shards can cut your lungs! 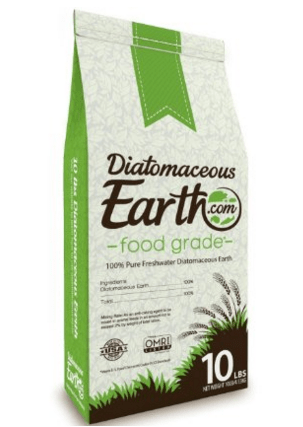 The benefits of using diatomaceous earth are that it’s safe for people and pets, and plus, pests don’t build up a tolerance since it totally acts by way of slicing their bodies (I know, sounds horrible, doesn’t it?? LOL). You can use it on the outside of your home, too (although you’d have to apply it again after it rains), and in gardens. I plan to dig out my big bag from the garage and dust the diatomaceous earth behind dressers, under my washer and dryer, along baseboards, behind bookcases, etc, and all the little nooks and crannies that can’t get vacuum often. Boric acid powder – Use it in cracks and crevices, and keep it away from kids and pets. 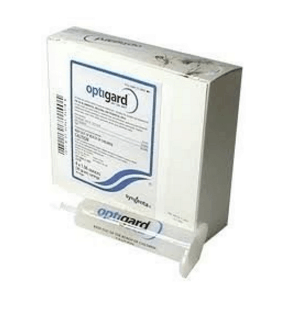 Optiguard – This gel ant bait is what I use around the house when I see an ant scouting for food. Put down a piece of paper or a strip of painter’s tape, load up a few globs of the gel on the paper or tape, and the ants will swarm it. In about 24-48 hours, the ants will be totally gone. Works like a charm! It gets 4.5 stars on Amazon, too. I highly recommend this! Another good option is Terro gel ant baits. 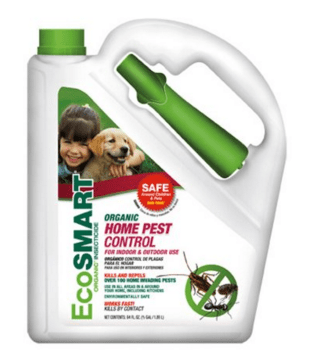 Ecosmart Organic Home Pest Control – Safe for people and pets, spray this around the baseboards of your home, and along the outside, if you don’t have a pest-control company. STEP 7: Store Things Properly! This is where I failed. Most of you already know that wool should be stored clean and in air-tight plastic containers, or with cedar. I have just never thought about it since we aren’t a big “wool” family. And before now, I had never noticed the problem with storing wools. 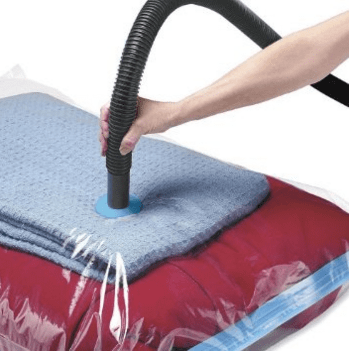 After finding carpet beetles and seeing holes in the wool fabric in my fabric stash, I ordered some of these SpaceSaver Premium Jumbo Vacuum Storage Bags. You can probably do the same with trash bags and just tie them off. But I wanted something legit. And I figured these would be prettier and easier to stack! Just make sure that you thoroughly wash everything that you’re storing away first. These bags keep out bugs, dust, mildew smells, water–everything. Can’t wait to stash everything in them!! 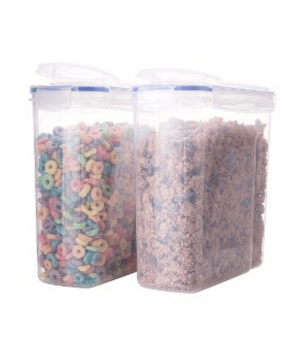 In the kitchen, be sure to store your cereals, grains, and sugars in airtight containers, like these. I try to store as much of our things in these. Just know that professional pest control isn’t cheap. We pay about $60 a month for them to come bi-monthly (in-between visits are free), which I think is worth it (although hubby complains about the cost). We still aren’t pest-free. I still find big ‘ole spiders in the glue traps that we use. But the amount of ants we have now compared to what we had when we first moved in–OMG–it’s 10K times better. Pest control people create a barrier around the house that works better than what I could probably do. Once I get the rest of the crafting closet cleaned out, along with going through our walk-in closet and making sure there aren’t discarded wools or silks lying around in there, I’ll see if that is enough to eradicate the pesky little carpet beetles. In the meantime, America Pest Control is already monitoring the problem and will hopefully be able to offer a solution after I do my part of getting rid of (or properly storing) old wool and silks. Bugs are a big PITA (pain in the a$$). My husband is much more tolerant than I am. If I find even the smallest gnat, I go into Super Combat Mode, whereas he thinks if a bug isn’t hurting you, you don’t need to hurt it. Sorry! I completely disagree. :). Home is where you are supposed to be comfortable, safe, and at ease. Bugs can steal that from you. Hopefully, though, following these steps, we can be one step closer to being more comfortable in our homes, without annoying pests! 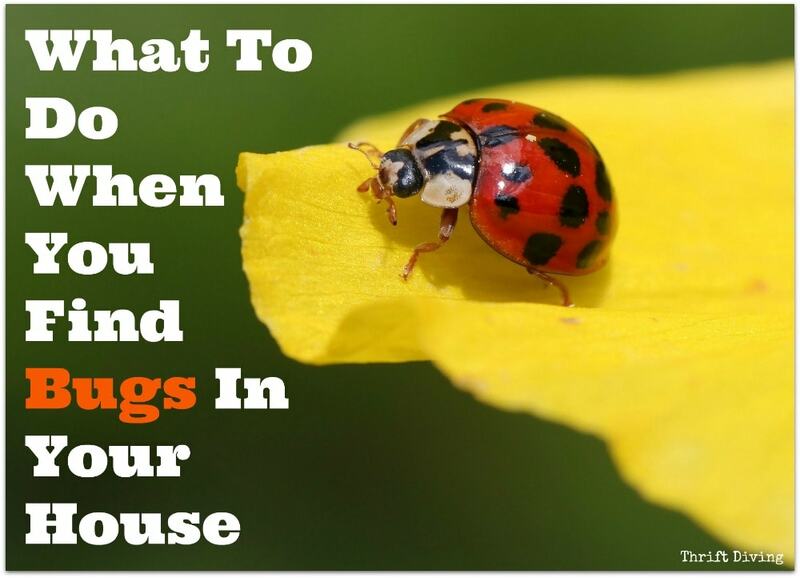 Do you struggle with pests in your house? What is your advice for getting rid of them? Leave a comment below and let’s chat about it!! Yikes! I don’t even want to think about it!! LOL Yesterday I literally spent 12 hours STRAIGHT cleaning everything in the kitchen (behind the fridge, under the stove, and more). I’m trying to locate the source of the infestation and I think I may have found another source–under the SOFA! I’m grossed out! LOL. Must spray tomorrow!! Do you have a lot of fabrics laying around in your craft closet? ugh, so much cleaning! Cleaning is probably my least favorite thing to do, so I’m sure our house really needs a deep clean. Thankfully most of my fabrics are just piled on my desk and the ones that aren’t are in little plastic bags (like the ones that sheet sets come in), so hopefully I don’t have that problem with fabric. Just wanted to let you know that i really enjoy your blog. It has inspired me to look at things differently and try my hand at repurposing. Thanks for all your hard work both physically and then with the blog, because i now how much work that in itself is. Oh no…I too have a few wool rugs stashed around the house. Time to check them and either donate or keep them properly stored – haven’t tackled those rooms (panel & basement rooms). 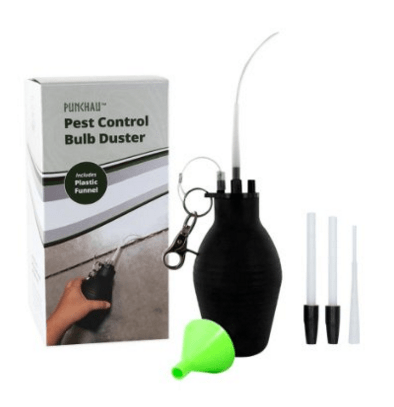 Thanks for the product suggestions & tips – a bulb duster?! – never would have thought of it – makes sense to use in crevices. Every now and I then I see very hairy centipedes – yuk – but after reading what they do, I no longer try to kill one, I tell it to go forth and eat the other bugs! Good timing. Just this evening, I found ants around my kitchen sink. Bought out the leftover Terro from last year and a ten year old box of diatomaceous earth, since I know the ants are outside, too…..next step is the optiguard and Ecosmart indoors. Right now, an exterminator is more than I can manage, but your suggestions will help until things improve around here. We were sitting on the deck in the spring sunshine today, watching wasps explore for nesting places. It’s always one insect or another, and it brings home again that when we all have disappeared due to chemical/radiation exposure & drastic climate change, the insects will still be here. They can have my wool stash then! Meantime, maybe we’ll figure out way to eat the critters. i hear that chocolate covered ants are tasty!!! LOL But expect you would rather starve first, as I would. The only insect that really freaks me out is the poisonous brown recluse spider, which I’ve not seen yet in my house, but am always on watch for them. The black widows outside under the rocks are not a problem, as they are out there and i’m mostly inside. And I don’t turn over rocks carelessly. Hey, MJ!!! 🙂 Glad you subscribed, too!! I cannot stand bugs! They are nasty, nasty things. I am always getting hoards of those tiny sugar ants by my kitchen table, it seems like no matter how much I try they never fully go away. 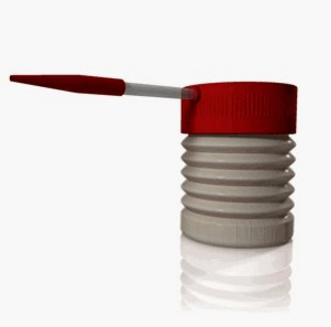 When they do show up, I immediately get out my “ant killer”, it’s a mix of cornmeal and a little bit of sugar. I just sprinkle it on the ground around where I see the ants. They swarm the stuff immediately and take it back to their hole in the baseboards. By the next day, all the cornmeal is gone, and so are the ants (until new ones sneak through the door again) because ants cannot digest cornmeal, they eat themselves to death. It’s a nice alternative to chemicals which I try to avoid for my children and pet’s sake. I might have to try that bagged product and see if it helps behind my washer and dryer, I am always getting rolly-polly bugs back there. Oooh, yeah, I have heard that cornmeal works! Don’t they explode?! 🙂 I don’t feel sorry for them one bit. 🙂 The diatomaceous earth should work well behind the water and dryer!